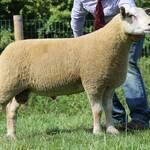 Show Champion Lot 11 from the Artnagullion Flock sold for 2,100 gns. Reserve Champion, ewe lamb Lot 126 from Stephen Macauley, sold for 1,100 gns. 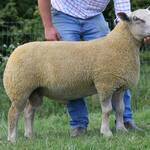 Lot 66 from the Carnew Flock sold for 700 gns. 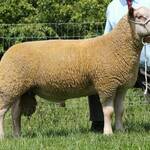 Lot 64 from Craig Brothers Ballynoe Flock. Lot 68 from Diane Christie, Lornbrook Flock. Lot 92 from Norman McMordie’s Riverdale Flock. Lot 94 from Norman McMordie’s Riverdale Flock. Lot 108 from Bryan Berry’s Banville Flock sold for 800 gns. Lot 111 from McConnell Brothers sold for 1,000 gns to Diane Christie. Lot 4396 1st prize early December class. Sold for 550 gns. 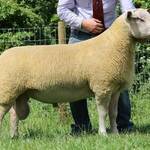 1st prize untrimmed ram lamb, Lot 4568 sold for 700 gns from the Bronwydd Flock. 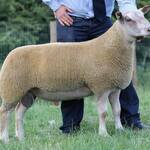 1st prize January born ram lamb, Lot 4617 from the Castellau Flock sold for 750 ghs. Show reserve champion, shearling ram from the Sulwood flock, sold for 1,000 gns. Winner of the Signet performance recorded class, Lot 4445 from the Arbryn Flock. Sold for 650 gns. Foulrice Onyx sold for 1,500 gns. 1st prize untrimmed shearling ram, Lot 4143 sold for 780 gns. Show Champion and sold for 3,000 gns Arbryn Ottoman. 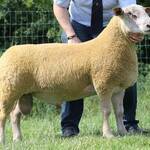 Top price at 3,200 gns, Aberkinsey shearling ram. Lot 4400 sold for 1,350 gns from the Glyn Coch flock. Lot 245 Arbryn Nuggett sold for 2,600 gns to Robert Harris. Lot 228 Dalby Nice One Son sold for 2,900 gns to Ian Matthews. Lot 204 Gogwell Number 1 sold for 1,600 gns to D. Evans, M Jones and H Roberts. Lot 202 Aberkinsey Navara sold for 1,900 gns to M Simpson. Lot 86 Foulrice Nuria sold for 5,200 gns to E Buckley. Lot 87 Foulrice Nelson sold for 2,000 gns to Arwel Owen. Lot 100 Banwy Nut Cracker sold for 2,400 gns to R Templeton. Lot 175 Sheldon Nelson sold for 2,000 gns to Brian Davies. Lot 182 Wernfawr Nuclear sold for 2,300 gns. Lot 183 Wernfawr Nacho sold for 1,700 gns to P Quick and M Alford. Lot 200 Aberkinsey Notorious sold for 2,900 gns to George Booth. Rhaeadr Nectar sold for 2,200 gns to R J Berry. Loanhead Magnum sold for 3,000 gns to Huw & Bronwen Evans. Loanhead Monarch of the Glen, Champion sold for 5,600 gns to Jonathan Barber, Geoff Probert and Peter Vaughan. Lot 129 Kings Land Mr Muscle sold for 1,000 gns to William McAllister, Artnaguillon flock. Lot 128 Kings Land Megastar sold for 1,600 gns to Carol Irwin, Brandywells flock. Lot 301 Arbryn Midas sold for 3,100 gns to R Annett, Northern Ireland. 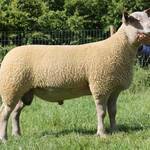 Right – Lot 218 Wernfawr Magnum sold for 5,200 gns to Mr & Mrs Jonathan Corbett, Wedderburn flock. 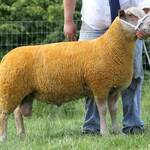 Lot 215 Logie Durno Magnum sold for 5,600 gns to Adrian Davies, Glyn Coch flock and David & Paul Curran, Wernfawr flock. Lot 177 Wraycastle sold for 2,600 gns to Andrew and Jan Walton, Rainbow flock. Lot 162 Lowerye Marvel sold for 3,000 gns to Jonathan Barber (Crogham flock), Charles Sercombe (Dalby flock), Medwyn Lloyd (Meyne Flock) and Laws & Davies (Crugyn flock). Lot 159 Rhaeadr Midas sold for 4,400 gns to Alan & Herbie Kennedy, Parkgate flock. 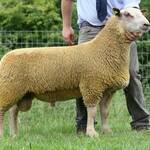 Lot 154 Rhaeadr Mark sold for 3,600 gns to Dewi Evans, Ffrwd flock. Lot 152 Rhaeadr Minder sold for 4,800 gns to Peter & James Vaughan, Kings Land flock. Lot 151 Loanhead Midas Touch sold for 7,800 gns to Peter Wood, Knockhill Flock and half share retained by the Ingram family. Lot 108 Dalby Malachite sold for 6,500 gns to Robert Gregory, Edstaston flock, Abbie Moseley, Knockin flock, Andrew & Jan Walton, Rainbow flock and Tim Greenow, Fortress flock. 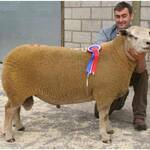 Lot 68 Glyn Coch Mr T sold for 4,400 gns to Meilir Jones, Aberkinsey flock. 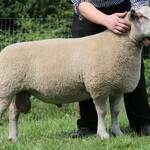 Lot 67 Glyn Coch Main Man for 3,360 gns to Robert Gregory, Edstaston flock and Abbie Moseley, Knockin flock. The Glyn Coch flock of Adrian Davies prior to the sale. 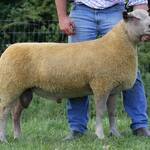 Top-priced ram at the sale, Lot 102 from MConnell Brothers sold for 3,600 gns to Trevor Bell, Comber. Lot 65 sold for 1,300 gns to Eamond Guinlivan, Eire. Two other top-priced ram lambs from Norman McMordie’s Riverdale Flock. Lot 64 sold for 1,200 gns to Liam Conway, Eire. Lot 63 from Norman McMordie’s Riverdale flock sold for 3,000 gns to Lionel Organ, Carmarthenshire. Lot 50 Rockvilla Mufasa, Champion in the pre-sale show classes from the Rockvilla Flock of David and Liz Mawhinney sold for 1,400 gns to Albert Ferguson, Eire. 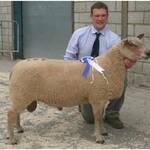 Reserve Champion from the Parkgate flock of Alan & Herbie Kennedy sold for 700 gns. Champion from Mark Worthington sold for 875 gns. Top price ram lamb was from Nigel Sheldon’s Wrenvale Flock. Lot 5063 Wrenvale Master, sold for 3,050 gns to Meilir Jones and Edward Lloyd Lewis. 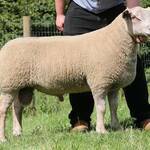 Also from the Bachymbyd Flock, Lot 4811 went for 3,100 gns to David Roberts for his Boyo flock in Shropshire. 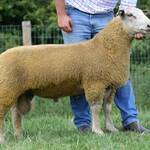 Top price at Builth NSA Main sale was Lot 4823 from Huw Robert’s Bachymbyd Flock. 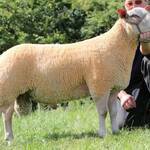 Redhill Charollais from Rutland paid 3,800 gns for the tup. Top price ewe lamb from the Carnew Flock sold for 1,750 gns to Mr J Kennedy, Maybole, Ayrshire. Top price at the Worcester Saucy Sale – Tullyear shearling ewe sold for 2,700 gns to Esmor Evans, Mold. Champion of the pre-sale show classes was from Cyril Dougherty’s Shamrock flock, which sold for 1,000 gns to Eddie Buckly, Southern Ireland. 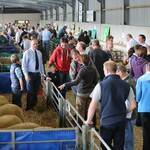 Garriston Flock Dipsersal – ewe lamb at 1,600 gns and shearling ewes at 1,200 gns and 1,100 gns. 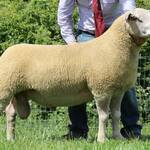 Two top-priced in-lamb shearling ewes from the Garriston Flock of Kenton Foster, 2,200 gns, 2,100 gns. Right top price ewe lamb sold at 1,700 gns. Lot 58 from Drew and Stephen Cowan also sold for 1,000 gns. 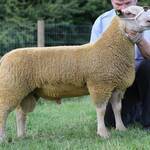 Top price sheep at Dungannon Sale, Lot 57, Tullyear shearling ewe sold for 1,900 gns.